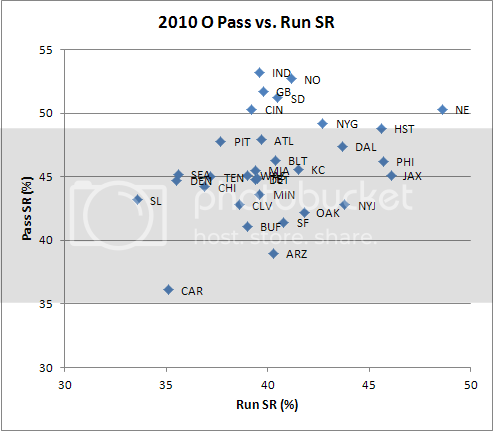 Here is the plot for 2010 offenses. Running success is the x-axis, and passing success is the y-axis. You can see NE far out on the top right. They're good at both and are very balanced. We think of NE as a passing offense, but they're running game is actually more successful compared to the rest of the league. Teams such as IND, NO, GB and SD could pass well but were average at running. ARZ could run the ball fairly well, but had no passing game. CAR could do neither well. Now let's look at defenses. This is the same general idea, and we can see the diagonal trend indicating the correlation. The better teams are up and to the right. PIT and BLT appear to be the top defenses in terms of SR, but they're both slightly better and stopping the run than the pass. 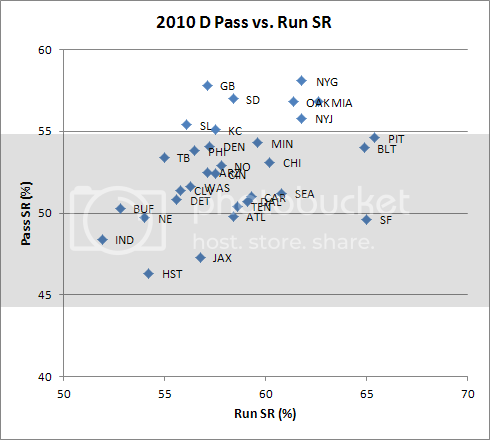 MIA, OAK and NYG were both more effective against the pass than the run. Teams like NYJ are more balanced. I was surprised that the CHI defense wasn't among the league elite this year. SF appears to have been far too focused on stopping the run in 2010. IND and HST were ineffective in both categories. And look who else is in the bottom left quadrant: NE. This does not necessarily indicate overall weakness as much as it indicates strategy. NE's doctrine might simply be to not give up the big play. Still, no matter what a team's defensive doctrine may be, it's better to be in the top-right quadrant of the graph than the bottom-left. Either way, this suggests the way to slay NE is death by a thousand cuts. A steady, short-game, ball-control game-plan would likely work well. It would take advantage of NE's propensity to allow modest yet successful plays while minimizing the risk of turnovers. It might also chew up a lot of clock, minimizing the number of total possessions, which is usually helpful to the underdog. Nothing groundbreaking, I just think this is a handy way to look at information. Perhaps next season I'll add automatically generated graphs like this (for any stat) where you can visualize where teams stand in various dimensions of performance. I'm sure you've probably fielded this question a number of times, but how much consideration have you given to including SR in the predictive model? I'm assuming there will be a certain degree of overlap between, for example, O-pass efficiency and O-pass SR and that the two will correlate to an extent. Is there a way to reduce the overlap while accounting for SR? Your "success rate" stat is looking better and better as an analytical innovation all the time. In fairness, SR has been around for literally decades. Mine's a little different, though. My only real contribution is in discovering its relationship with other variables and its game theory implications. I realize this is off topic, but I think you are the one to answer this question. At the end of the BCS championship game, Oregon (with one timeout left) ties it with 2:36 left. Wouldn't the best strategy have been: onsides kick, then if you don't recover, allow Auburn to score quickly and try to answer the score to force overtime. This is a general endgame problem for a team scoring late. The onsides kick plan might not work in the pros, where the offense might play for the last second field goal, but college kids would have a hard time stopping themselves at the 1 (ala Brian Westbrook) in order to run out the clock. Little differences can make a big difference. A lot of general ideas are around for ages before a specific application of them really pays off. Are you implying you believe there is causality? The way you've worded it "running sets up the pass" makes it sound like you believe that running calls the tune (i.e. that there's cause and effect). The 'vice versa' suggests that you don't mean to imply causality, that "passing sets up the run" could be equally true. Presumably to show causality you'd have to do something akin to Football Outsiders "Establishment Clause" research to see if there was a correlation between 1st quarter run success rate and subsequent pass success rate, right? If you don't believe running *can* set up passing, you must believe coaches irrationally waste a whole of lot of resources coaching and calling play action. Anthony-No. You don't need to run a whole bunch in the beginning of the game to set up passing. What matters is the defense's expectation of the offense's strategy mix. It's the threat of running at any time or the threat of passing at any time that keeps defenses honest. Different situations call for different strategy mixes. Please read the 'How Coaches Think' article for a more complete discussion.